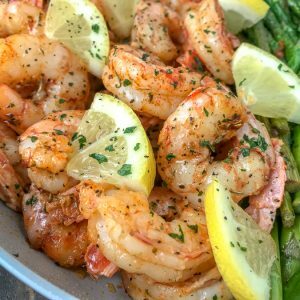 Lemon Garlic Butter Shrimp with Asparagus – this is an easy, light and healthy dinner option that is cooked in one pan and can be on your table in 15 minutes. 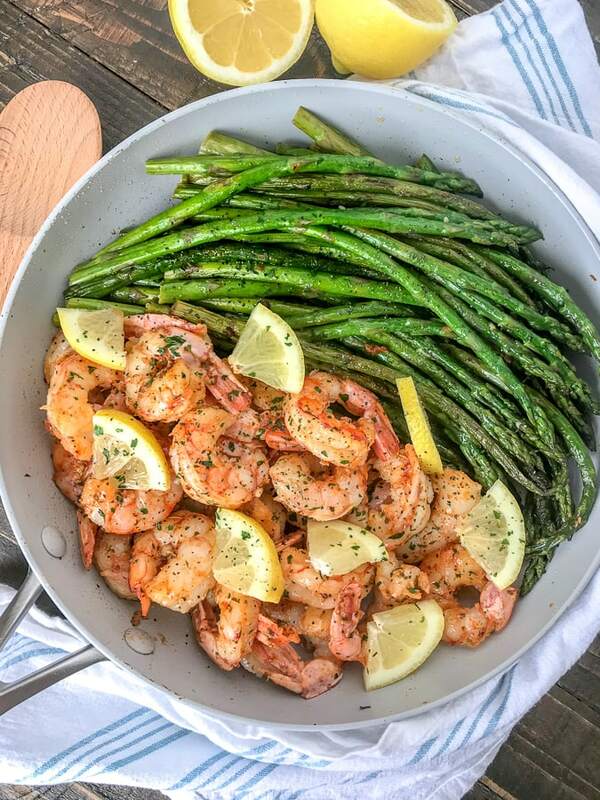 Buttery shrimp and asparagus flavored with lemon juice and garlic. Only 309 calories per serving! Incredibly easy and incredibly delicious! This is the kind of recipe I live for. Why? Because it’s easy to make, takes minimal effort, and is a hot meal on my dinner table in 15 minutes. I had some asparagus that needed cooked, but I have a feeling this dish would taste amazing with a side of pasta or, if you’re looking to keep this meal low-carb, with zoodles (zucchini noodles). Maybe even spiralized sweet potato “noodles”! Mmmhmmm. 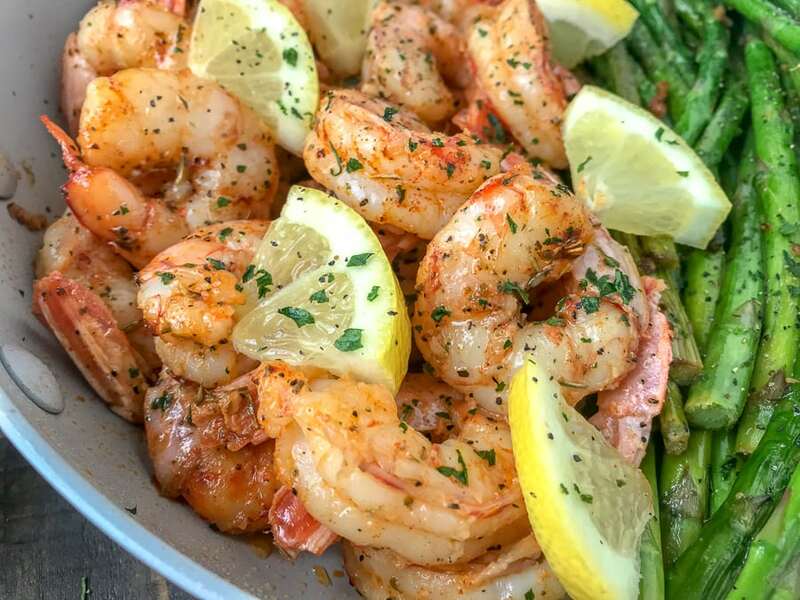 The freshly squeezed lemon juice compliments the flavor of both the shrimp and the asparagus very well. It gives this already tasty dish a refreshing and light boost for your taste buds. I recently discovered the use of a garlic press. My oh my how I have been missing out. If I am feeling lazy – I will use jarred minced garlic. I’ll admit it. Using jarred minced garlic happens often because my life gets to be too busy and a bit tiresome to be standing in the kitchen manually mincing garlic cloves. It’s tedious is it not?? Not to mention it gets sticky and your hands, as well as the cutting board, smell like garlic. Not that I mind that. It’s more of the sticky aspect for me. Enter into my life the newly purchased OXO Good Grips Garlic Press. I was simply amazed at how quickly and how easily it was to peel the garlic, snip the ends, and press it. VIOLA! Minced garlic with one squeeze. Needless to say, I was/am a happy camper. And hey, I feel like I am doing my fingertips a service in saving them from getting snipped! Mincing little cloves of garlic is not for the faint at heart. Or, in my case, the klutzy people. I keep the bandaids on hand. So if you’re looking to save yourself some time, sticky fingers, and a garlic-smelling cutting board – you are going to love the use of a garlic press! Buy wild caught shrimp. Don’t buy farm-raised. I assure you that you are only sacrificing flavor. Aim for the medium to large-sized shrimp, as well. More of a flavor impact! When buying, pay attention to the packaging. Buy shrimp that has already been deveined, shelled and cleaned. Tail-on or tail-off with this recipe is entirely up to you. I left the tail on for visual effect. Use as fresh of ingredients as you can. Fresh parsley, freshly squeezed lemon juice, and freshly minced (or pressed if you have a garlic press) garlic. Fresh is always best when it comes to maximizing flavor. Don’t short yourself! Buy wild caught shrimp. Don't buy farm-raised. I assure you that you are only sacrificing flavor. Aim for the medium to large-sized shrimp, as well. More of a flavor impact! Use as fresh of ingredients as you can. Fresh parsley, freshly squeezed lemon juice, and freshly minced (or pressed if you have a garlic press) garlic. Fresh is always best when it comes to maximizing flavor. Don't short yourself! this looks amazing! in the third picture, is that cauliflower rice I see or something else? Hey Shannon! Yes, that is plain cauliflower rice! That’s the same kind of garlic press i have! i’ve never tried to press the garlic without peeling it first. does that work? I made this tonight and it came ouT great! Thank you for Sharing your recipe! Thank you, Evelin! I’m so glad you liked it! 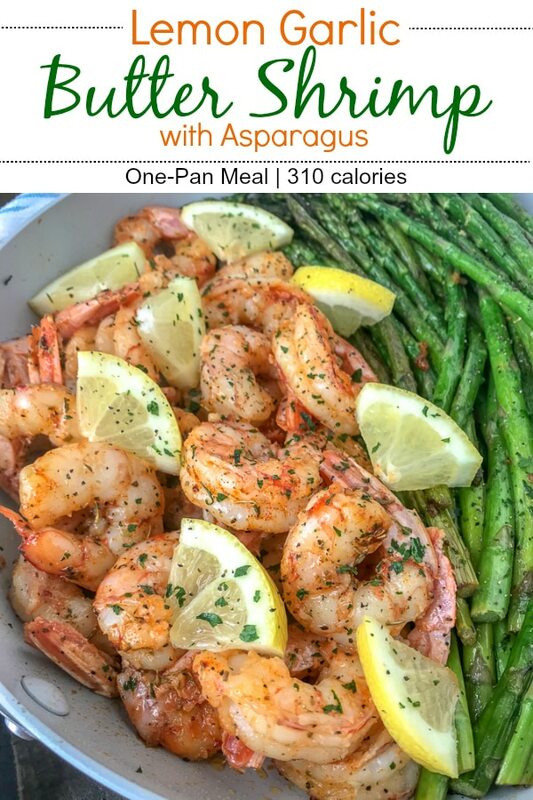 I did the shrimp by itself and asparagus seperste! So amazing!!!!! I dont even like shrimp and i was chowing down. Thank you, Suzanne! I am so glad you and your husband enjoyed the recipe so much! Means a lot. I love TJ’s seasonings – I will have to try that one some time! So fast. So good. The entire family loved it!!! Absolutely! You can use the vegetable of your choosing! I’m still learning a lot when it comes to cooking, what kind of butter would I use?? Hey Ashley! You can use regular salted or unsalted butter or even yogurt butter. Your choice! How is this 1400mg oF sodium? That is dangerously high for one meal. Can i do something different to avoid such a high Sodium content? 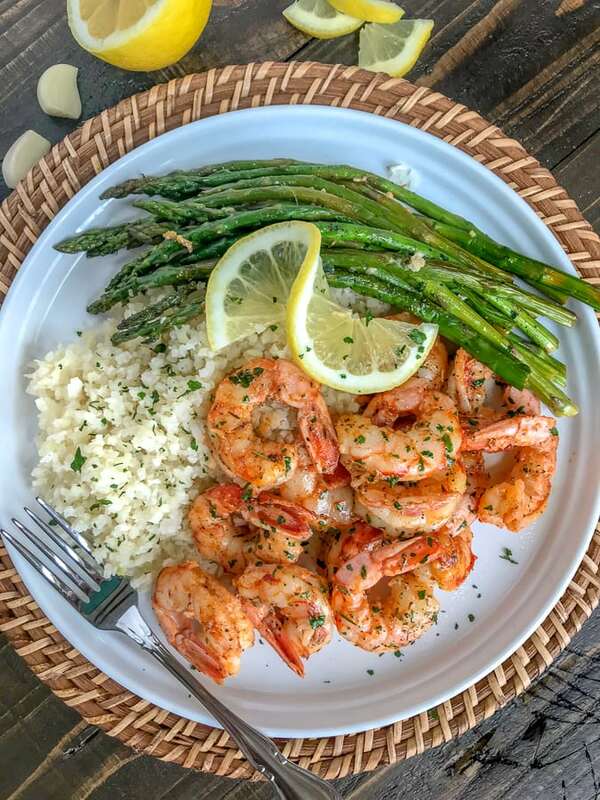 I had the same question on another shrimp recipe – shrimp are normally high in salt (guess it’s where they come from); use olive oil instead of salt, and omit the salt elsewhere (you can always add it at the table). 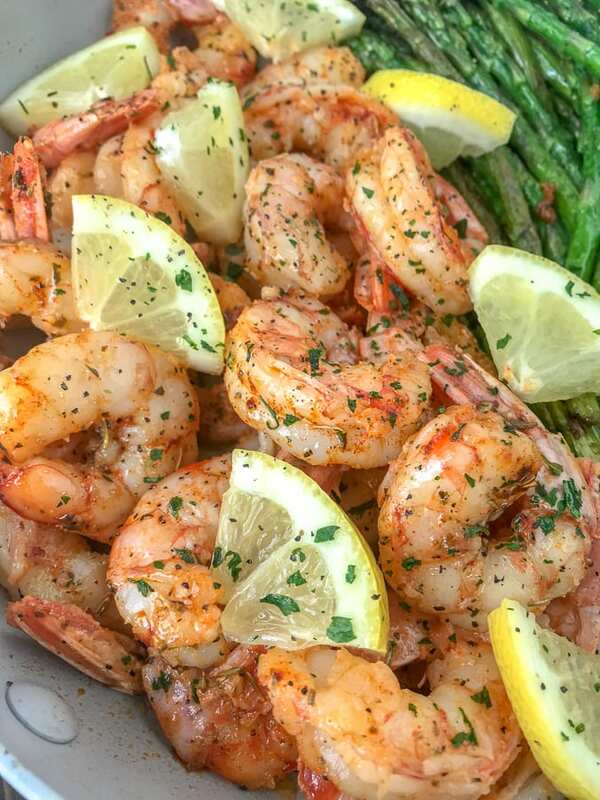 I’m going to make this; i love shrimp. Thanks, Lacy! I order online from Alaska. Comes straight to my door! Best way in my honest opinion. O-M-G this was amazing!!! So so quick and easy to put together and such delicious flavor I will definitely make this many many more times! Thank you, Denise! I’m so glad you liked it!